Lou Loves Beauty: How to fake healthy hair. How to fake healthy hair. Most of us like the whole "dewy" make up look, you know - when the skin glows from within looking radiant and healthy. When hair is in tip top condition it tends to shine and one of the tell-tell signs of hair in bad condition is the lack of shine. So how can we achieve this and fake the shine? Fear not I'm here to help and the process is in fact quite simple in the products you can use and the techniques available to make the hair shine, looking healthy and worthy of any Timotei advert. When we apply make up we always prep and prime the skin ready, and the same steps can be taken in our hair routine. Using products designed to reflect the light and smooth the hair can make it look healthier, even if it isn't! With the magic of products and styling we can fake it! 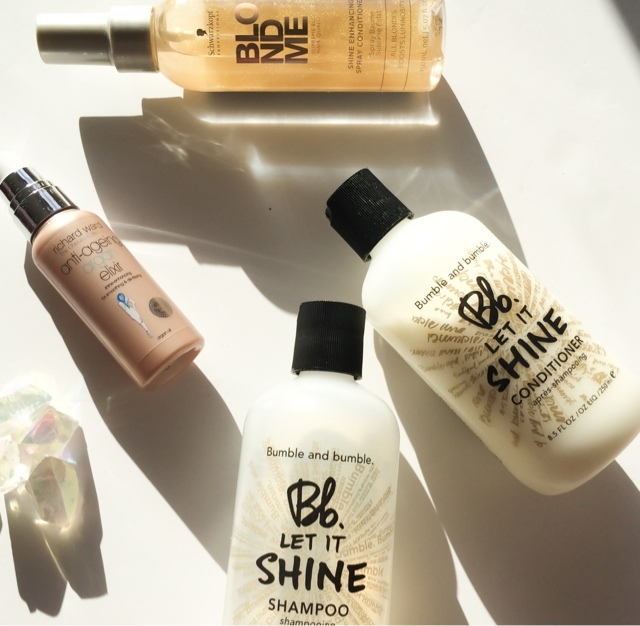 Bumble and Bumble Let it Shine Shampoo* contains Sunflower which helps to dissolve "dulling residue" while preserving hairs natural oils. The Let it Shine conditioner* is light weight (ideal for fine limp hair types), non greasy and conditions hair leaving it feeling soft and tangle free. When rinsing out the hair the best way to not only make sure all the products are out but increase the shine is to rinse hair in cool/cold water. I know this sounds for the brave hearted and especially coming into winter, but it really does work. It helps close the cuticles and can even help control oil production. A smooth sleek cuticle is going to reflect the light and give the illusion of healthy shiny hair. The reason why healthy hair tends to shine and damaged hair looks dull and life less is that the cuticles are flat and laying down and not rough and textured. We all know a smooth surface will reflect the light more than and uneven one. I think it's always best to go in with a leave in treatment or serum if your hair is especially dry. These will add further nourishment and coat the strands, surrounding them in a protective barrier that with reflect the light and increase shine. The ones I really like using are the Milkshake Incredible Milk 12 Effects and the Richard Ward Anti-Ageing Argan Elixir* which is light, non greasy and does a fantastic job at taming and smoothing the hair making it look in tip top condition. Once all the prep work is done it's time to blow dry and this is where the most results are achieved. When blow drying your hair you want to make sure the nozzle is pointing downward in the direction of which the hair falls. This will help smooth out the cuticles and improve the overall texture of the hair. Turn up the heat. I know we're all told how bad this is for your hair but it really makes a difference to smoothing out the hair and moulding it into place as the heat will soften the bonds and make it easier to manipulate. When blow drying try to use bristle brushes rather than plastic or metal. These are really going to add grip to the hair so when your pulling the hair around them they're going to smooth it out more. Curling Wands and Straighteners are also going to smooth out the hair and give it more of a polished look. Once the style is achieved blast the hair with cool air. Much like when rinsing the cool hair is going to set the style in place and set the cuticles laying flat. To finish off you can use a serum or shine spray to greater enhance the shine. Schwarzkorf Blonde Me Shine Enhancing Spray conditioner* is the same consistency of a dry oil, contains tiny flecks of gold shimmer (which is perfect for blonde hair) and they also do one of darker hair and brunettes. It catches the light and smoothes fly away hairs without making it look greasy or weighing it down. 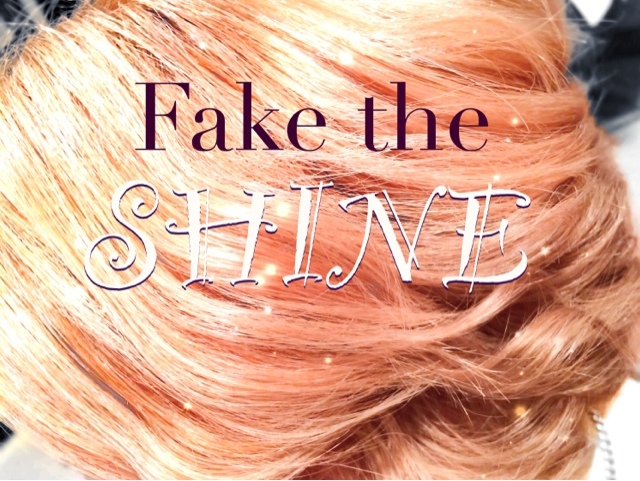 What are your tip for faking healthy hair and making it shine?